In her presentation, Arend discussed being intentional about how we as teachers select the learning activities we give students. She did an excellent job of putting her finger on ideas that had been floating half-formed and mostly ignored around my head. For instance: If all you want students to be able to do is to apply a set of routine skills (think: click here, then click here, then click here to access this database and limit to peer-reviewed articles) then the most effective way to help students learn may well be lecture and/or drill and practice. If you want students to develop problem-solving skills, on the other hand, you’ll want to get into assigning labs and projects that allow the students more freedom to analyze and act on their choices. She breaks down the different types of learning a teacher might be looking to create in students, and then helps you think about choosing activities that suit the kind of learning you’re hoping will occur. When you start applying this, you see things like how mere behavioral skills (click here, click here, click there) don’t need elaborately planned activities for students to learn them. Instead, you can and should devote most of your planning and class time to projects and activities focusing on higher-order thinking skills. Better still, find a way to flip your classroom so that you don’t have to spend *any* classroom time on purely behavioral skills, and can do more with the limited time in your one-shot session. I also like the way you can apply this to all the things we talk about here on MakerBridge with pedagogy and maker activities. How do you know when a maker activity is appropriate for your classroom? You think about what you want your students to be able to do by the end of the lesson, figure out what kind of learning needs to occur for that to happen, and then decide whether a maker activity is an appropriate way to achieve that. If all you want is for your students to know where to click, you don’t want to waste precious time on a maker activity. If, on the other hand, you want to get into higher-order thinking skills… ahhh, then you just might be in business! 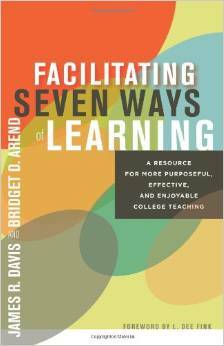 Anyway, Arend was a great speaker, and I’m eager to get my hands on her book Facilitating Seven Ways of Learning so I can get into more depth with her ideas. She links to a free sample chapter from her website, if you’re not yet convinced that you really ought to read this. But you really should be convinced! Have any of you already discovered Arend and her work? Or does my brief (and jet-lagged!) description ring any bells for things you’ve been thinking about lately? Drop us a line in the comments, or send a tweet to @makerbridge or me (@mitchee3) and let us know what you think!